One of our favorite meals in this family is tacos….tacos of just about any kind. I guess there is just something about filling a tortilla with your favorite fixins that makes tacos so much fun! 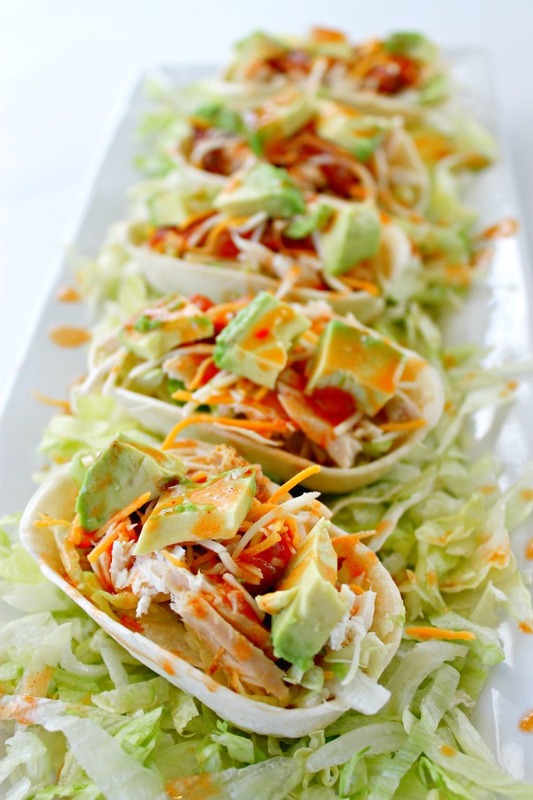 These Sriracha Chicken Tacos in mini taco boats are quickly becoming a family favorite.They are so easy to make and sinfully good! I serve them up in these awesome Old El Paso Mini Taco Boats Soft Tortillas, and my kiddos love them! I use all store bought items to make these tacos, so other than warming up your tortillas (if you like them warmed), there is no cooking involved! I simply buy a rotisserie chicken from the grocery, then lay out a bunch of different toppings and let everyone make their own. 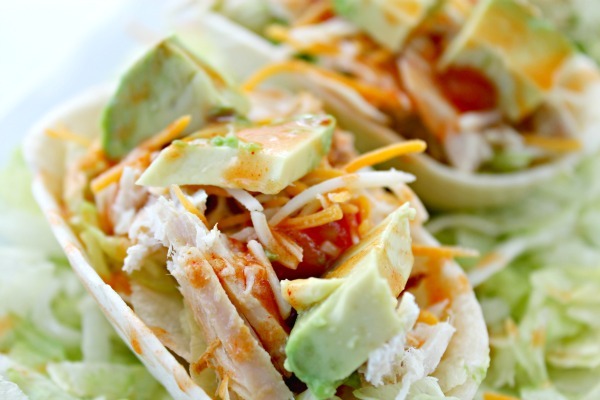 These have shredded lettuce, shredded rotisserie chicken, salsa, shredded cheese, chopped avocado and a little sriracha sauce over the top. 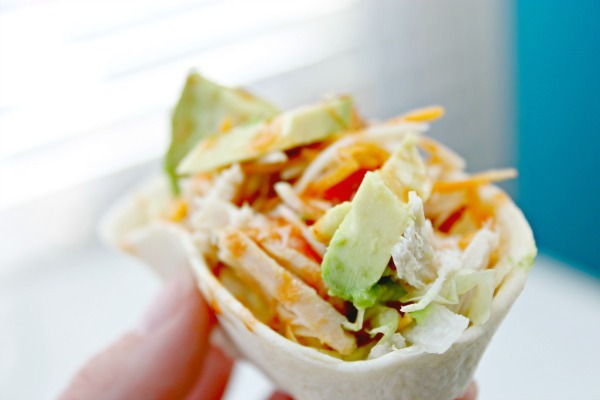 Served in the mini tortilla bowls, they are super easy to eat as well! Old El Paso’s new Mini Taco Boats are flour tortillas formed into a unique boat shape with a flat bottom making them easy to hold, less messy and ready to be filled to the brim with “whatever floats your boat.” They are the perfect shell for taco night and are sturdy enough for those who really like to fill up your taco bowls! My favorite use for them is the Sriracha Chicken Tacos, but we have also used them for ground beef tacos, pork tacos, and steak tacos too! Next on our list is breakfast tacos with eggs, onion, peppers, sausage and cheese…doesn’t that sound delish? 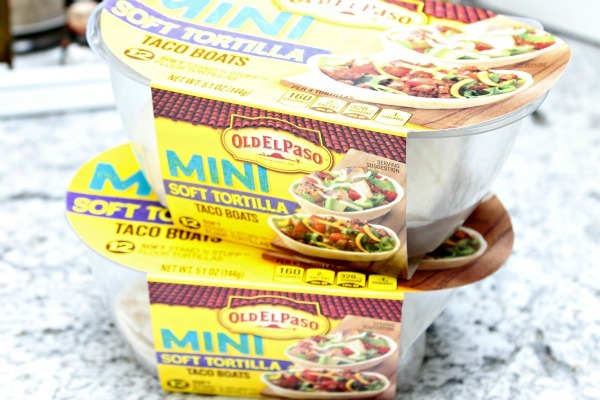 Share what Taco Night looks like at your house by tagging @OldElPaso and using the hashtag #TacoBoatSweepstakes on Twitter or Instagram, or by posting on Old El Paso’s Facebook wall using #TacoBoatSweepstakes, and you could win a year supply of Taco Boats from Old El Paso! Visit OldElPaso.com/TacoBoatSweepstakes for more details! Cheers, and Happy National Taco Day! This post is sponsored by Old El Paso and General Mills. All photos, ideas and opinions are 100% mine.